Finely slice the garlic and finely chop the Chinese chives. Slice the spring onion into rings. 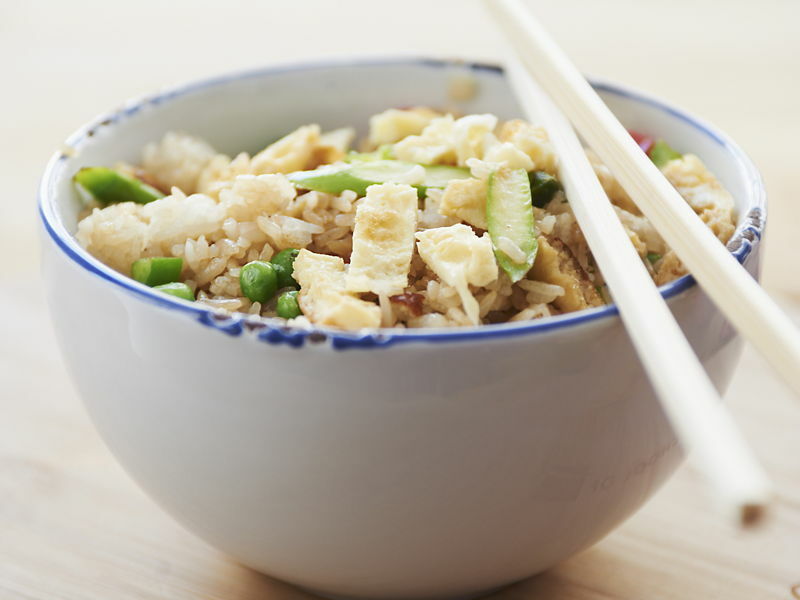 Place your egg at 12 o’clock, then arrange the garlic, chives, rice, peas, sauce ingredients and spring onions clockwise around the plate. Heat 1 tablespoon of vegetable or garlic oil in a wok over a high heat until smoking-hot, then crack the egg into the wok. Carefully fold the white of the egg with a spatula so as not to burn it, trying not to break the yolk as you go. Once the egg is halfway cooked and the white is fully opaque, break the yolk and cut into the white with your spatula, creating pieces. Once smoking-hot, add the garlic and Chinese chives, and stir-fry for 10–20 seconds. Add the rice to the wok, keeping a high heat, and mix well, trying to separate the rice grains so as to remove any large clumps. Once the rice is well mixed, add the peas and continue to stir-fry for 1 minute. Add the sesame oil and mix together well, then season with black pepper to taste. Spoon into a large bowl and scatter over the spring onion to finish.